I’m sure many will ask me why buy the “China Phone” hadn’t I seen enough? Will you ever use one? The answer is simple. It’s a learning sample, an artifact to share, and something I can get a physical reaction and response to from others. Plus it cost me just over $100. And you can laugh as it won’t work in the US as it isn’t tri or quad band and it works on the wrong spectrum. Then there is the fun I had haggling down the price and the very real reactions I had from top end users when I submitted it in an Indian focus group session (another post coming!). From a product development standpoint where we are all ingrained with Nokia’s, Treos and iPhones it’s really nice to have something to play with that confounds both expectations and judgments. 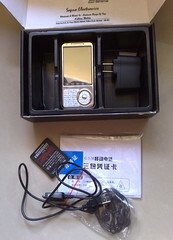 My “China Phone” (it will never be a Prince see the box) will never be a killer product here and probably wasn’t in China either. What it does is makes you see things differently. For me that is the point of many research projects. To think different, to see the world through a new lens. These are a few areas where my exposure to it has helped me think differently. 1. Sound! It’s louder than any phone I have ever had. It has four speakers. This sound perspective is much broader than just the mobile phone. It is about getting noticed in very noisy environments, it is about sharing music when hanging with friends or being able to fill a small room with sound. Here’s a contrast story (perhaps too close to home) my daughter complains her new iPod Touch doesn’t have speakers, it makes the iPhone way cooler for sharing. The Touch needs speakers. It also needs louder speakers. It really matters when sharing video. What’s interesting is this sound perspective works into other product categories. Who’s ever heard of a phone that plays music better than a laptop, (better may be louder!). These phones beat my MacBook Pro. If you have such a phone would you buy a laptop for music or iTunes if it didn’t play it out.. or have longer battery life etc? And on this phone the speakers are understated. Others come with big round speakers and I saw 8 and 12 respectively on other phones. Point is a simple phone of less that $100 has really re-framed what I’m seeing and begs a whole lot of new questions about sound and entertainment. The difference is the emerging Indian consumer is likely to purchase a new DVD, laptop, TV etc coming from a “mobile” perspective. By contrast we buy mobiles already having used those products which form our perspective. Mobiles for us.. tend to under deliver. They do browsing worse, play music worse, etc. In fact they are just plain hard. What I see in the China Phone on sound is they perform better (better means louder for some segments in India) than the “branded” models (Sony’s Walkman phone’s aren’t in the same league on music and yet are marketed on music). 2. Sharing and Service: The buyers of these phones don’t have a music collection. Music comes from some “music provider” who has a PC in the back-room and loads it onto the card. It’s a small fee or even free with the phone. As none of the users have ready internet access, bluetooth becomes a simple viral way to share. I still see little bluetooth sharing of files here. Once in a while, a picture. However, when the music is loud and audible… sharing and requests are more likely to come. This phone has many smart phone features built in. Although how you transfer a contact list is not easy. I am so used to synching one Nokia with the next (it’s a real lock-in strategy) that I was pleased my iPhone could synch with my Mac. There’s no directory thinking in this China Phone. I’d have to start from scratch and that would be impossible. Sharing vcards is built in; probably another reason for the bluetooth. 3. Touchscreen: Yes it has a single touch screen. For most things it works better with the pen rather than the finger. I find the text input difficult although I can see how the touch screen really helps in China. For English letters it is just a slow input method. I’ve not really mastered it or found the setting I prefer. I have to wonder why it has taken so long to get effective touch screens coming into mobile devices. I was using Palm’s handwriting 10 years ago on a PDA. Then abandoned. Apple’s typing touch screen on the iPhone is a huge leap forward when you see it like this. I’m convinced we’ve been too wedded to keyboards and small screens. Picture dial, buddylists are more effective than numbers. The days of the number centric phone are probably numbered. The question is what sort of keyboard is required. 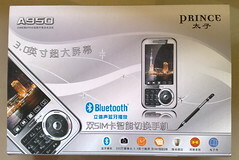 China Phone – Prince A950. Google it to find out more details. It’s basically the same size although thicker than my iPhone. The screen 320X240 is larger than my N95’s although less resolution. The aesthetics are generally good. The key pad is ok and generally I get how the keyboard layout works. The menu system seems very Nokia-like although I don’t know what it is based on. There are no surprises in the menu. It follows what the traditional cellphone manufacturers do. Quick / shortcuts are available for music, messaging and the phonebook. This works very effectively. Sound is loud from the speakers. Even the 2mpx camera / video makes a very very loud and ugly click. The camera is ok but you wouldn’t buy this phone for its camera. Unlike many popular phones it doesn’t have a radio built in. However, the next step up in price has radios and TV’s built in. Sound for calling is only ok. It has a connector cable that is both USB and charger ready. The charger is not elegant (similar to Nokia’s and is 110 to 240 volts ready. Thus you can charge from a PC or wall socket. You can also read the disk on a Windows PC. I couldn’t read this phone from the Mac. No synching appears to be available. My experimentation here was limited to putting on music and that took time. Most users of this phone would have someone put the music on for them. The instructions are Chinese. It comes with a headset and second battery. There are two sim card slots inside. The battery is a good size, plenty of talk time here. There’s no warranty that I understand. Various people have told me that drop them a few times and it is done. Although I’ve visited a busy repair market for these phones. This phone is not a status symbol in a brand sense; it is very good value and I can see why many budget users are moving up to them. The response here from my kid friends was generally favorable. It looks cool, the sound really stunned them and most wanted to make it work. It doesn’t look cheap. As I won’t be really testing it I can’t tell you how long it stands up to abuse. However, I suspect that more and more getting more than 12 months out of your phone without a rebuild / repair is good going. One thing missing in the US is an effective repair and rebuild market. It doesn’t exist because phones are just too cheap. Overall, I’m impressed with this phone. We certainly lack the choice for mobile handsets in the US. I’ve seen hundreds of models for sale in the same place in Mumbai. As a purchaser you are probably better off buying a refurbished Nokia that’s a year or so old than buying this phone. However, then you would miss out on the latest statement. It’s a Ghetto Blaster Phone. I think they are likely to become a whole new genre. On what software does this Prince A950 mobile phone runs? Hi do u know how to use this for dialup internet on PC using GPRS. I have managed to get GPRS working on the Phone. i am having a Chinese models:A950.one of my fried followed the procedure settings -Restore factory settings-pin he entered is 1122.now thw phone is in Chinese language mode.no display and no out goining.but incomming is comming. what i want to do to bring into previous(normal)mode of working. also when i click on restore factory settings it again ask for a pin number ..what is it ? how i can activate NOP(GPRS) in my mobile. i have china mobile Prince A950 & i have Airtel prepaid Sim . so please out of these difficulty . I’m closing the comments on this post. I really have no information or instructions for how to use or manage the A950. Many of the problems seem to be the same. So buyer beware!